Who Doesn't Love Homemade Sausage? So you want to make sausage but don't know what you need to get started? Well, you've come to the right place. Here is everything you need to start making your own sausages! Grind your meat using a meat grinder. Add your sausage seasoning and water to your meat and mix in a meat mixer. Feed your meat through a sausage stuffer and fill your sausage casings. Close your casings using twine or hog rings. For smoked sausage, smoke in a meat smoker or cook in your oven to 165°F. Taste: Your sausage will taste better. You can customize your preferred blend of spices and seasonings. Quality: You're choosing which cuts of meat you're using. You will never wonder if a nose or ear or another unwanted part is in your sausage! Health: You add as little or as much fat and salt to your sausage as you want. Plus, you're not adding chemicals, additives, or preservatives - unless you want to. Cost: When you make sausage yourself, your sausage is less expensive than mass-produced sausage. Control: If someone else processes your game, then you have zero control over the processes they use. You need to test the internal temperature of your sausage to make sure it has cooked all the way through, just as you would with other meats. When making sausage, make a shorter sausage of the same width, to use for testing the internal temperature of the meat instead of puncturing a larger one. Put a piece of tape on the spot where you plan to stick (test the internal temperature) the sausage, prior to cooking, and this will help keep the casing from tearing. Cooking sausage at a too high of temperature will cause “fat out”. Faster is not always better. Keep notes. Sausage making is trial and error. List the percentage of each meat used and the seasonings. So next time you make sausage again you can adjust…and make more notes. Add at least 1 oz. of water per pound of meat to aid in the stuffing process. This aid in mixing the meat with the seasoning and will ease the stress put on the gears of your meat mixer and sausage stuffer. Try experimenting with liquids other than water when mixing your next batch of sausage. 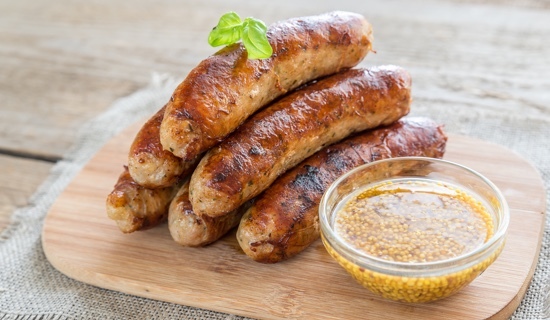 Try beer with our Bratwurst seasoning or apple juice in our Smoked sausage seasoning. The possibilities are endless. Have a helper when you do the stuffing. An extra set of hands sure makes the job easier the first couple of times. Don’t over stuff the sausage casings, especially if you are filling and then twisting. You need to leave a little slack for the twist. If filled to full sausage may burst upon twisting. After mixing the seasoning with meat, fry up a small patty to insure you have the flavor you want. Now is the time to adjust by adding meat to lessen the flavor or adding seasoning to make it more flavorful. Do it now so all your work (and meat) won’t be lost on a not so flavorful or too salty sausage. When using an electric grinder for stuffing, it might be possible for one person to do the job if you have a foot switch to turn on and off the grinder. With a foot switch, the person doing the job can have both his or her hands free to manipulate the sausage casing as it fills up with ground meat. When stuffing sausage, if you alternate the direction of your turns, it will keep the links from unraveling. If you always twist in the same direction, you’ll just end up un-doing the first sausage link. Still deciding which Casings to use for your sausage? Download our handy chart on Choosing the Perfect Casing . Need more information on Casings and why to use them? Learn more about Sausage Casings here.